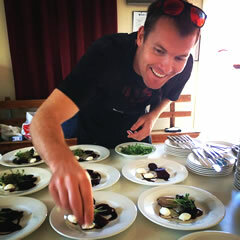 Born from our passion for the best Tasmanian produce,Wattlebanks Catering brings first class dining to your door. Let us cater your next event with fresh local produce, prepared by our team of talented chefs. We never compromise on quality, growing many of our own ingredients on our 20 acre property and partnering with the best local producers to bring you food from farm to plate. We are a fully mobile service and our modern kitchens are equipped to cater for intimate to large scale events. We aim to go beyond traditional catering services, using our diverse range of skills, knowledge and experience to provide a unique and memorable occasion for you. Get in touch today to see how we can work together for your next event. Rod began his career in Hobart institutions The Drunken Admiral and Peppermint Bay before expanding his career to Brisbane working at the Marriott Hotel, Cha Cha Cha and Riverside Plaza. He then ventured overseas to work and travel spending several years developing and working with foods from Londons Daphne's Restaurant, French Alps Chalets and the France/Swiss border area of the Jura and was a part of Etihad Airways Chefs in the Sky programme, a personal chef on board long haul flights. Now back in Tasmania having worked at Lenna of Hobart, Beachfront Hotel Bicheno and Smolt Restaurant Salamanca, Rod is now expanding with Wattlebanks Catering.